NIA’s Golf Tournament on Thursday, April 4, will be held at the Royal Blue course, which is located on property at the Grand Hyatt Baha Mar. Royal Blue Golf Course is a Jack Nicklaus Signature Golf Course with rolling fairways, moonscapes, and native landscapes. The course features dramatic views of the ocean on the front nine and forested panoramas on the second half. The course features a unique, single set of tees, course set up. 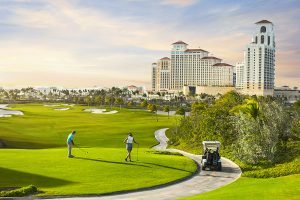 Each morning, a member of the golf professional team will thoughtfully place tee locations on the course, taking weather and playing conditions into consideration, to create a unique and optimal golfing experience. The course is located on property and is less than a 5-minute drive from the hotel. The hotel provides a complimentary resort shuttle to/from the hotel to the golf course. The 18-hole scramble will have a 1:00 p.m. shotgun start. Gather your industry colleagues and friends for an afternoon of networking and friendly competition! Preference will be given to foursomes. * Pre-registration is required and the per-player fee of $290 includes all tournament costs, a boxed lunch, GPS golf cart, prizes, a unique refreshment, and golf-bag pickup and return on the day of the tournament. All foursomes include a forecaddie, and gratuity is additional, the suggested gratuity for the tournament is $20 per person. Optional club rentals are available through the golf course for $95 (Callaway, Taylor Made, or Titleist), and rentals include 6 golf balls, plus tax, and will be billed by the course to your hotel reservation the day of the tournament. A putting green will be available for golfers before the start of the tournament, but there is no access to a driving range. *If you wish to create your own foursome, please contact the players to ensure their willingness to participate in the foursome, and then email your request to NIA at events@insulation.org. All players must be registered for both the Convention and the golf tournament. Golf shirts are available in men’s and women’s styles. Order your Under Armour golf shirt, with Heat Gear® technology, to help you stay cool, dry, and comfortable on the golf course. 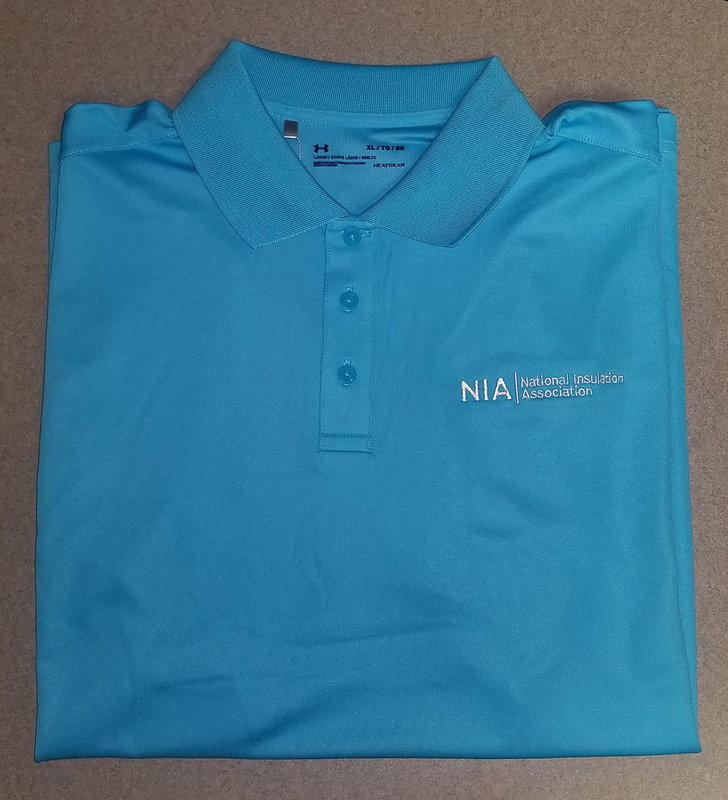 The aqua shirt features the NIA and Royal Blue golf course logo, and is available for $55, plus shipping and handling. Shirts will be shipped to you prior to Convention. The deadline to order shirts is February 13, 2019. Click here to order a golf shirt.